The Royal College of Occupational Therapists and the Tower Hamlets Together team were delighted to welcome Caroline Dinenage MP to Mile End Hospital last week in a visit to showcase how occupational therapy-led services are improving the health and wellbeing of people in Tower Hamlets. 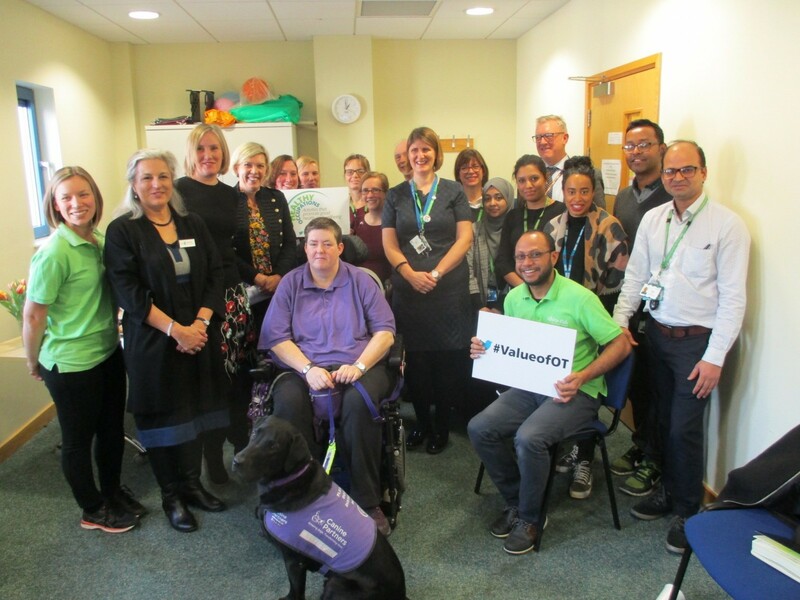 Julia greeted the Minister and introduced her to the Tower Hamlets Together team - Alex Hadayah, the service lead, several other occupational therapists - allied health professionals (AHPs) colleagues and senior managers. Karin Orman, Lead Professional Adviser from RCOT was also at the visit. During the visit, the minister was somewhat upstaged by Kingston, a 'Canine Partner' dog, attending with his owner Jackie, who talked about how her life had been changed by having an open-minded OT who listened to what she felt she needed, and Kingston! John Biggs, Mayor of Tower Hamlets said: “We are pleased to welcome Care Minister Caroline Dinenage to the borough to hear about our multi­agency work as part of Tower Hamlets Together, to deliver person centered care services which empower residents to lead more independent and healthier lives.